The ultimate guide to Montgenevre ski holidays. Small, traditional and full of charm, this friendly town is ideal for a relaxed retreat to the slopes with family and friends. Experience the excellent skiing conditions of the French Alps with stunning scenery and beautiful vistas hidden away on the Mont de la Luna. Set on the Franco- Italian border on the French side of the Milky Way, this small resort, high on the Mont de la Luna is the ideal destination for a relaxed holiday to the slopes. The ski area boasts a wonderfully snowy haven, seeing some of the best-snow fall in the Milky Way offering full sunny days of scenic tree lined routes. Just an hour and 15 minute transfer from Turin airport, the resort is easily accessible and you can also make an easy train journey by changing at Paris to take the high speed line to Oulx. Thanks to the traffic-free nature of the village, it’s a safe and peaceful area offering all types of stylish, centrally located accommodation. The après is very laid-back with a number of friendly bars and restaurants making for relaxing evenings after a long day of skiing. Non-skiers can visit the historic town of Briancon, do some ice skating and bobsleighing or step out at night for some torch lit, tree-lined snowshoeing. The laid-back, unhurried atmosphere of the resort makes for days of cruising the pistes and relaxed nights enjoying pizza, hot chocolate and cheesy fondues by the fireside. With excellent childcare facilities and terrain well suited to beginners, this is an ideal resort for family ski holidays. The ski schools have special children’s programmes and kindergartens with effective activities for introducing the first timers to the slopes. The wide variety of runs makes for wonderful days for family and friends out on the piste skiing the well-groomed breezy blues and wide open tree lines runs. The Mont de la Luna ski pass includes Montgenevre and access to the neighbouring Italian resort of Claviere. An extended lift pass can give you access to 400km of runs across the Milky Way covering Sestriere, Sauze d’Oulx, Sansicario and Claviere. View our detailed Montgenevre snow forecast or snow report and see all live webcams, piste maps, road and travel maps and lift pass prices. For a picture of historic snow conditions see the snow depths month by month with our Montgenevre snow history. With an excellent snow-sure record and beautiful scenic trails, this snowy blanket on the French side of the Milky Way offers every level of skier and snowboarder perfect terrain with excellent beginner areas, an expanse of intermediate trails and some thrilling free-ride terrain. The ski area is great for beginners with a nursery slope at village level and two excellent ski schools offering lessons especially designed for an introduction to the slopes. The friendly, unhurried atmosphere on the slopes will be greatly appreciated by skiers just getting to grips with snow under their skis. After conquering the chairlift and the snow-plough turn, beginners have free reign and can ski right back to the resort from Les Gondrans at 2455 on a wide, windy run or head over the border to Claviere for some Italian snow. Intermediates also have a huge amount of snow to explore. With a handful of tree lined reds, you can glide through the trees or tackle the moguls. Boarders are well catered for with a number of carving runs. Take the red Colletto Verde linking the French Montgenevre across the border to Italian Claviere for breath-taking views on a sunny backdrop. Those more advanced can enjoy some steep black runs as well as a vast amount of free-ride areas. The trails on Le Chalvet make way to some of the best untouched off-piste – hire a mountain guide from one of the local ski schools for a great way to explore this terrain. For some more challenging runs, the ski pass can be extended to include the rest of the Italian Milky Way for some more challenging runs. Freestylers will find a terrific snow park and half-pipe located beneath the prarial chairlift and you’ll find a brilliant border-cross over towards Claviere for some competitive riding. 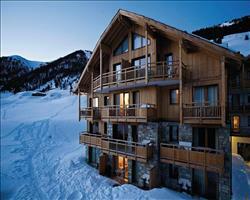 A relaxed atmosphere and laid-back family feel are what attract many skiers to this small resort. Evenings are spent with a hot spicy wine or chocolatta at casual eateries offering pizza nights and friendly dinners with a delightful mix of French and Italian cuisine. Le Napoleon is the place for some traditional Italian wood fired pizza and pasta dishes, whilst Le Jamy offers the authentic French bite, famed locally for its cheesy fondue. For lunch on the mountain, there are some lovely slope-side cafes with wonderful sunny terraces or you can ski over the border to grab a bite at an Italian restaurant. After working up an appetite on the slopes, head to Ceasars for a pancake or take away a pizza for a quiet night in, whilst a night out with fine food and succulent wines at Le Transalpin can’t be beaten. For a touch of decadence, book a table at La Tableau at Le chalet Blanc hotel. The gourmet dining experience would be ideal for a special occasion or romantic dinner. Snowshoeing, ice climbing, sleigh rides and ice skating are just a number of non-skiing activities to get involved in. Children can enjoy the Monty express, a toboggan slide down from the top of Chalvet gondola and the historic town of Briancon is just a 15 minute drive. Quaint patisseries, local grocery stores and clothing shops line the streets of the authentic town for a shopping-filled day and a weekly market of local produce is also held in the centre. The end of the day doesn’t mean the end of the fun as there is the chance to do a night snowshoe trek with ESF School, or lose yourself in the starry sky on a walk guided by an astronomer. After a long day on the skis you also have the option to take some time out to be pampered at one of the wellness facilities. When is the best time to ski Montgenevre? The high piste means an excellent snow-sure record for the mountain and boasts some of the best snow in the Milky Way. This means amazing skiing conditions throughout the season that can last until late-April. The altitude and N/S orientation also means the slope gets a large amount of sunshine so long Easter days of snow-sure skiing can be spent alongside beautiful scenery on wide open sunny runs. The resort is considered a gem of the Italian Alps and is rarely as crowded as the better known resort in the French Alps so whilst the slopes fill up at weekends and holidays, the piste remains unhurried and relaxed with no overcrowding. With an unhurried pace on the slopes and a relaxed après atmosphere, this small alpine resort is excellent for the whole family. Le Chalet Blanc hotel offers doorstep skiing and a touch of luxury, Le Hameau des Airelles Apartments are in a great central location close to the ski school meeting point, great for families wanting to cater for themselves. For a cosy family getaway, Chalet Ourson is just 4 minute walk to the ski meeting point and offers a traditional alpine experience. The ski schools here have excellent children’s programmes so you can be sure your children are in reliable hands while you spend the day exploring the piste. Club Piou Piou is the kindergarten run by ESF and is excellent for the little ones with fully qualified instructors. The Jardin des Neiges is an area dedicated to beginners and offers a fun introduction to the snow for the children in a peaceful and steady environment. The run is set up with activities to introduce the first techniques of skiing and awareness of the slopes such as a roundabout for balance and mini-bumps for turning practise. After conquering the chair-lift, beginners can join the group to ski the top of Mount Agnes. Take the easy green Sagnes to descend a wide open windy run to the base or meet up with a cruisey blue. A green run and border cross expands the ski area over the Italian border to Claviere, you can take the whole family for a taste of Italian lunch on a sunny terraced café. The laid-back après atmosphere and friendly feel of the town is ideal for families. Evenings usually consist of a casual meal in Le Jamy or pizza night at Caesars with delicious hot chocolates and cheese fondues. There are also loads of après activities for the whole family, such as ice skating in the resort centre or snowshoe guides through the forest. Children can take a thrilling ride down the Monty express, the toboggan is said to be the longest in France. Our holiday packages make an easy holiday all-round with flight and transfers included. Have a look at our holiday deals to find the best one that suits you or call us with your preferences. Groups looking for an expanse of varied terrain by day and a relaxed après atmosphere by night will enjoy everything this charming town has to offer. For a luxurious group getaway Le Chalet Blanc hotel offers beautiful décor and wellness facilities to wind down in tranquillity at the end of the day. We have loads of accommodation suited to large groups such as Hotel Anova with ski-in ski out accommodation to suit everyone’s needs. Chalets such as Chalet Etoile des Neiges hold up to 15 people and offer a more intimate holiday for groups or you can chose an apartment for a self catering holiday. Beginners can make the most of the ski school with lessons on the nursery run at the foot of the slopes and find some steady runs at high altitude, whilst more advanced skiers can take off to explore the rest of the Mont de la Luna or venture further across the border Sestriere or Sauze d’Oulx with the extended Milky way lift pass. After a day on your skis and boards the group can meet at Refuge bar at the bottom of the main run for some warming vin chaud. Heaps of charming restaurants in the centre means the whole group will be satisfied, those wanting a casual night can grab a pizza from Caesars and head to Ca del Sol for a quiet drink and those looking for a night of amazing food and wine can settle down for a meal at Le Transalpin. For special occasions or a night of luxury, Le tableau at Le Chalet Blanc hotel offers a fine dining experience of delicious French gourmet. Any non-skiers in the group have loads of activities to choose from - take a day trip to the nearby historic town of Briancon, just a 15 minute bus ride, or take to the shops in the centre for some local buys and mountain specialities. Accommodation comes with a variety of travel options so you can choose what best suites you or call us to make the arrangements for you. For groups looking to travel from different locations via different modes of transport you can check out the independent travel section for our accommodation only deals and let everyone sort out their own journey. Our best deals include flights and transfers and those visiting on four wheels can select a holiday with channel crossings. 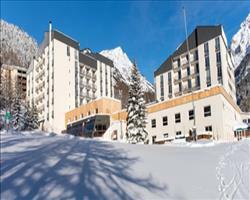 "Best family ski resort in Europe, probably the world!" We chose Montgenevre as it always wins awards for “best family place” and it really is the perfect place for families, I would definitely recommend it. There’s loads of stuff here like a special sledging park which children love. Last year was the first year my youngest son had been skiing; they actually noticed on the CCTV that he was getting tired and fed up, and they came up on the snowmobile and cheered him up with a lift back down – which he was absolutely thrilled with! It’s really nice as a family to know they’re looking out for you. This was a fantastic place for my kids to learn to ski. If you have really good skiers, Montgenevre is not as challenging as other resorts, although if you’re not restricted to childcare times you can ski all around the mountain through to Italy and have an amazing day. There aren’t many technical blacks but there are a couple. We don’t eat out much as we self cater, but there’s a very good pizza restaurant (although I can’t remember the name!). All the restaurants looked really nice and nowhere was too expensive. Before we had children, we used to ski the 3 Valleys where you have loads of options on the mountain if you want to stop off. Here it’s a bit harder to find somewhere for lunch, you have to plan your ski around it a bit more. The first time we skied here was the first week of my children’s Easter holidays, it was before the main UK school holidays and there weren’t any French and Italian school holidays, so it was really quiet. This time round we went at half term and I had to tell the children to prepare for it being a lot busier but it wasn’t busy at all! We never ever had to queue, not even once which was fabulous! We self drive and I was initially worried about the road conditions once you reach the mountains, but the French and Italians are very good about clearing the roads so there’s nothing to worry about. If you fly, the transfer time from Turin is really short – under an hour. Montgenevre was phenomenal. You can ski across the border into Italy where you have all the Milky Way to explore (if you don’t mind sitting on the lifts for a while you can go over to places like Sestriere). The food in Montgenevre is quite expensive compared to over the border, especially if you nip back to the village at lunch time. I found that the food is a lot better and cheaper in Italy, especially on the mountain. The skiing is good for all abilities, intermediates probably fare the best but there are lots of greens for beginners. The area is never that busy which is a big plus; it only really gets busy after 4 when everyone skis down the back mountain. They used to be slow and rickety but they’ve invested a lot since the Olympics in 2006 and the lifts are now very good. There are loads of other things you can do like go down the toboggan run or go up the mountain in the evening on a ski-do for a meal and then ski or get the ski-dos back. You’ve got a good range of shops if you forget any equipment and although there aren’t many bars, we found a couple of really good ones. "Better for skiers than snowboarders"
Montgenevre is OK, although the link to Italy is very flat; I’m an advanced intermediate snowboarder and had to walk every time and I was with 4 other skiers who found it hard work as well. Once you’re over in Italy, the price of food on the slopes drops dramatically and is a lot cheaper, it’s just a bit of a mission to get to. You also have the bulk of the Milky Way ski area over in Italy. We had the Milky Way pass but it depends what kind of skiers you are, I like a different area each day but if you like to ski the same slopes and get familiar with them, you probably don’t need the whole area. I wouldn’t massively recommend the area to snowboarders, it’s more of a skiers resort, especially over in Italy where there are lots of flat parts. We ate out in Montgenevre a few times and it’s fairly standard ski resort food. It wasn’t the liveliest ski resort town I’ve been to and is more of a quieter family resort. Montgenèvre was fab - so many brilliant long green runs even high up in the mountains which was great for the kids as beginners. Ski school worked out really well too - great instructors and lovely atmosphere. Other than the fact that not a flake of snow fell while we were there (would have added to the general magic of it all!) we were also incredibly lucky with the weather - beautiful bright blue skies and full sun pretty much every day. Thank goodness we took lots of suncream. I'm very tempted to go back to Montgenèvre again, wondering how anywhere could be better, but hopefully in the coming years we'll discover other such gems and come back raving about them too. Hope you get to go out and enjoy the skiing too as well as helping everyone else book brilliant holidays. 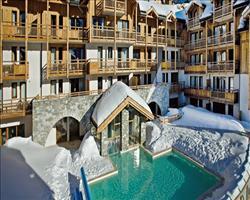 We’d been to Montgenevre twice with young children and I would recommend the resort to other families. We’ve always used ESF in French resorts for the children as France is one of the only countries that has ski school for 3 year olds - no problems with the lessons. The transfer is good as it’s only 1.5 hours. The only thing that let us down this year was the lack of snow at Christmastime. There was still enough to keep us going though, with decent conditions on the glacier (which is snow sure) and the nursery slopes were still skiable for the children. With decent conditions, you can get over to Sauze d’Oulx and Sansicario. All of the good bits of the expensive french alps resorts, with less of the bad bits. Lovely snow and sun, good range of slopes - but lifts could be a bit quicker. Really nice relaxed feeling on the slopes with no overcrowding and very few of the "idiots" that fill some resorts now. Really enjoyed our trip to Montgenevre, the staff were very friendly and helpful. The resort has a nice laid back atmosphere. I would definitely recommend Montgenevre to other families. "Great variety and potential to go into Italy"
"Modern family resort with mixed level skiing"
We’ve been here a lot. The skiing is mixed level, there are some blacks and some reds. It’s a good, family sort of place and we like it. The town of Montgenevre is modern-looking, there aren’t many old buildings. Overall it’s quite small and there’s not loads to do. Also, there’s not much shopping, there are only a few food shops and they are quite expensive. There’s a nice hotel near Le Hameau des Airelles Apartments which serves good food but again it’s expensive.